The description autogyro is a very accurate description based on the ability of the rotors to draw air from above while in flight. Instead of the air rushing past the wing of a fixed-wing aircraft and generating lift, it rushes through the rotor, causing it to spin. This powers the auto or free spinning rotation without making use of engine power. The only time the rotor is power by the engine is before take-off to get the blades’ rpm (rotations per minute) high enough to generate lift. 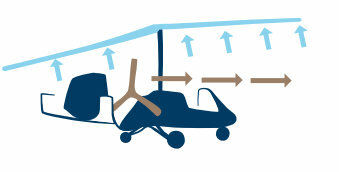 While the upwards air flow through the rotors provide the lift the gyrocopter needs, the engine powered propeller generates the thrust to provide the forward motion.